The Lab Master® Slip and Friction is designed to precisely determine the friction characteristics of numerous materials. It removes operator variability from the test procedure with specially designed features to control sled placement rate, orientation/angle, dwell time, and removal. The new Windows ™ Based Software features: The ability to create user-defined test setup with built-in ASTM, ISO and TAPPI methods, individual test speed selection for both static and kinetic COF, exporting capabilities of graphs or data to Microsoft Excel® and SPC files, and enhanced calibration-verifies existing and new calibration, and keeps a calibration log for ISO record-keeping. Integrated PC system running Windows™ based software. 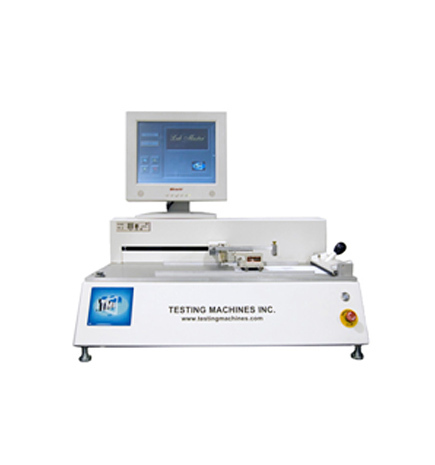 User can pre-select test speed, delay time, and test distance. Units are displayed in gram force or COF. The ability to create user-defined test setup with built-in ASTM, ISO and TAPPI methods. Individual test speed selection for both static and kinetic COF. A high-speed data acquisition system accurately locates and captures the static peak. A computer controlled elevator system automatically lowers and raises the sled at a repeatable rate. Automated Elevator System removes operator variability from the test procedure with specially designed features to control sled placement rate, orientation/angle, dwell time, and removal. Optional peel attachment available for 180° adhesion or release measurements. Flexible packaging, Foils, Paper, Corrugated, Coatings, Metal, Wood, Printing, Nonwovens, Rolling resistance, Writing instruments, Medical devices, Composites, Rubber, Linoleum, Textiles and Leather Meets TAPPI T549 and T816, ASTM D1894 and D4521, DIN 53375, and ISO 15359.